When Dragon Age: Inquisition was released in November, I stated on a podcast that I felt the game’s protagonist, The Inquisitor, was the weakest the series had to offer thus far. A bold statement, but one that I vehemently stood by in the 40 hours it took me to reach the credits of Inquisition. In the two Bioware games I had most recently played prior to Inquisition (Dragon Age II and Mass Effect 3), both went to great lengths to define the characters of Hawke and Shepard outside of the choices you were making vicariously through them. Hawke suffers great tragedy in his time at Kirkwall while the game helped refine him by giving him one of three distinct personalities depending on the player’s dialogue choices. Mass Effect 3 gives Shepard much more development outside the player’s actions by focusing inward on the Commander’s struggle with having the galaxy’s future on his shoulders. The Inquisitor? The most blank slate I had played as in quite a long time. Alongside being a pretty bare-bones character, the Inquisitor also suffered from a very inexplicit backstory and the story of Inquisition begins at a pretty poor place for anyone looking for any sort of insight as to who this person really is. I learned that my human mage Inquisitor came from a noble family and was part of the Circle of Magi, but very rarely found any sort of concrete details that I could relate to. However, after completing the game nearly two months ago and constantly reflecting on my time in his shoes, I’ve learned that my Inquisitor, August Trevelyan, and his story have both become a lot more special to me thanks to the wonders of hindsight. Granted, it is obviously easier to connect with a character after you’ve actually seen their story play out. Even Commander Shepard, a character that has had no small effect on my own life, wasn’t the character he became in my mind until I’d already played through the original Mass Effect. So it does make me wish I’d taken that approach to defining August while playing through Inquisition, rather than expecting Bioware to do all the heavy character development lifting for me. Now that I’ve finished Inquisition and can look back on it in its entirety, I’m constantly filling in the gaps that Bioware left open to define who my Inquisitor is. The best way to do that? Putting a lot of yourself in the character. It’s interesting thinking back on the Dragon Age series, because it feels like each of the three characters I’ve played as were snapshots of me during the time each game came out. My Warden, Kenneth Amell, from Dragon Age: Origins was an introvert, dabbled in the dark arts because he thought that was cool, but was still eager to use his abilities to do the right thing. Xavier Hawke from Dragon Age II was a sassy mage who was looking to make a meaningful connection he didn’t have to deflect with sarcasm. August Trevelyan was a frustratingly blank slate throughout Inquisition, but as I began to project my own ambitions, beliefs, and even my emotional baggage onto him, he shifted from my least favorite player character in the series to the most nuanced character I had shaped in the world of Thedas. He became a sarcastic, confident, but also somewhat self-serving individual. The Champion of Kirkwall and the Herald of Andraste. Two characters I shaped that came about in very different times in my life. They have their similarities, but they are also pretty different because of who I was when I made them. To Inquisition’s credit, when it comes to the themes and issues it tackles head-on, such as faith and tradition, the game gives you the tools to declare your Inquisitor’s opinion of much of the political and religious turmoil within the series. Inquisition thrusts the player into the center of religious reform as they become a symbol of one of the series’ potential gods: The Maker. As someone who left religion on bad terms nearly a decade ago, finding people looking to me for answers regarding their religion was not only unsettling, but something of a nuisance that distracted from my own goal, which was stopping the Darkspawn magister Corypheus. People were quick to assume that the existence of the Maker mattered to me just because I was being called the Herald of Andraste. Others I’ve spoken to about this on the opposite of spectrum talked about how it was unnerving for them to feel the weight of the game’s most widespread religion on their shoulders, as they deemed themselves unfit to be the voice of the Maker, saying they didn’t know what the god was planning, and didn’t feel like they were the rightful voice for this society’s god. On my end, I was more than happy to ignore the concerns of the masses, as I had decided that the religious implications of my existence “had nothing to do with me,” and weren’t my problem. Cassandra, a companion in the game’s party who was struggling greatly with what my being deemed the Herald of Andraste meant for her faith, asked me if I even believed in the god I was being associated with, and when I told her I didn’t, it informed my relationship with her in a way that’s not unlike the ones I have with my religious friends. I had conversations with Cassandra later where she would bring up the fact that our beliefs weren’t aligned, meaning that it was now one of August’s in-game traits that he was a nonbeliever, and it comes up later in the game where I had different dialogue options that reflected that. Telling Cassandra I didn’t believe in the Maker informed the way some characters spoke to me, and allowed me to give Corypheus one final insult before I defeated him. Even with the threat of a hole in the sky that was dropping demons on the world, for awhile, I didn’t feel like my Inquisitor had much of a motivation other than self-preservation to close the Breach and stop Corypheus. While I was fascinated with seeing what was happening with returning characters Cassandra, Varric, and Cullen, my Inquisitor wasn’t given much reason to actually care about what was going on until he had something to lose. Inquisition pretty much sweeps the player off their feet and into the conflicts of separate parties, most of which will likely have no affiliation with your character. However, when August met Dorian Pavus, a Tevinter Altus mage, I realized that even if he didn’t need to be invested in the fates of the Grey Wardens or the Orlesian hierarchy, he could still care about the outcome of these isolated wars if he had something that mattered to him that he didn’t want to lose. I came into Inquisition planning to enter a romantic relationship with Dorian, but I was unprepared by how holistically he would become my motivation to save Thedas. Even when I’ve experienced the world of Dragon Age from the viewpoints of both the Warden and the Champion, Bioware’s world was something I never valued to the same degree as the people within it. Meeting Dorian was the start of my realization that August and I weren’t that different, but in getting to know Dorian I realized how different our stories could be. I’ve realized by looking back that August had a lot more of me in his DNA than I had initially knew. By becoming the Inquisitor, he realizes he has to save the world, but was pretty much indifferent to most of the people he was surrounded by. Meeting Dorian, his goals gained a secondary motivation outside of saving himself, and gave me something to be invested in outside finding out what came next for the Dragon Age universe. After Dorian’s sidequest, an emotional reunion with his father, left me teary-eyed and angry, I became almost protective of my Inquisitor’s virtual boyfriend because he wasn’t just a PlayStation Network trophy to me, he was August’s motivation to save the world. It was surprising to find that having someone else other than just yourself to look out for could make achieving your goals all the more imperative. In Inquisition’s giant open world, I ignored the multitude of sidequests in order to ensure I could save Thedas, and more specifically Dorian. Then maybe when it all was over, my Inquisitor could get out of the Inquisition and live in peace. As I’m now realizing what separates my own life priorities and my Inquisitor’s, it has made a lot of the things I did and said as August pretty telling of the place I am in my own life. Inquisition has taken on new meaning, and has made it actually somewhat of an inward learning experience for me, one that will help inform my own life moving forward. Seeing the similarities between myself and my Inquisitor also points out how we are different. It makes me wonder if I’ve become more self-serving alongside becoming a more confident person, and it took finding something other than myself to worry about in a game to see that making your own happiness a priority isn’t mutually inclusive with only worrying about yourself. Hindsight is what makes Dragon Age: Inquisition and its protagonist all the more meaningful to me. 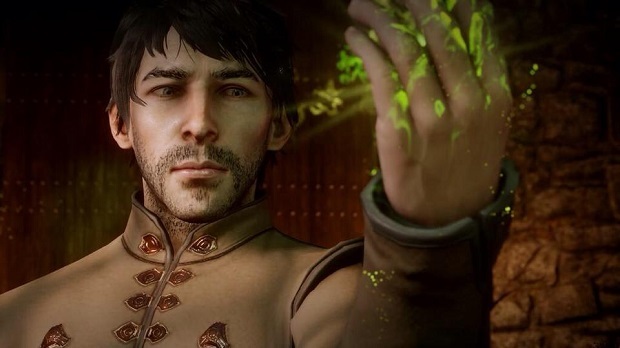 I may not have realized it all while playing through it, but August Trevelyan wasn’t just a blank slate, I was defining him with every connection I made and every opinion I gave him, and there’s a lot of myself within him. Next time I play a Bioware game, I hope I remember that my part in shaping my character doesn’t end after I finalize them in the character creator.